Children don’t come with a manual. Your first child is always a learning experience. I wanted to give a first time mother a list of few things that will help take care of her child’s teeth. The first tooth in babies will erupt between 4-8 months of age and kids usually get all their baby teeth by age two and half to three. Teething process is different for every baby. 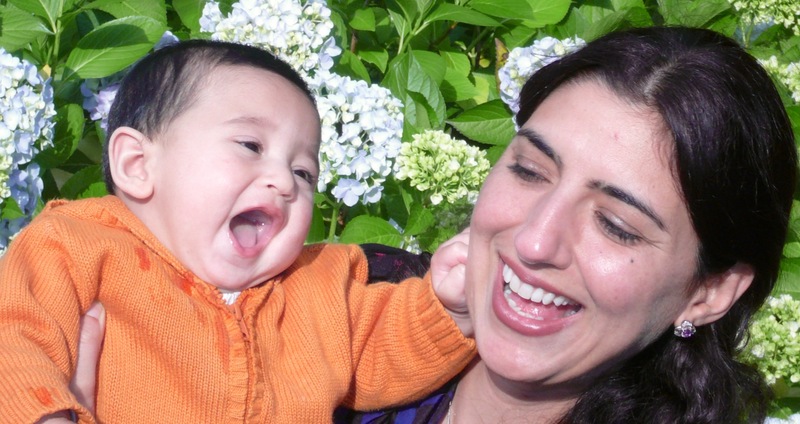 Some children have a difficult time during teething, while others sprout teeth effortlessly. Teething may cause increased drooling. Babies may refuse to eat due to pain in their gums. They often get restless and fussy. Pain due to teething may cause them to sleep less or wake up often. Referred pain from back teeth erupting may cause them to rub their cheeks. They will put their hands in their mouth and bite on everything they can get hold of. Excessive drooling around their mouth can causes rashes due to skin irritation. Some babies may get a low grade fever or mild diarrhea but it is very important that you get him or her checked by a doctor to make sure that they are not getting the flu, ear infection or diarrhea due to infection. (Children usually do not get high fever with teething). Massage the gums with a finger or wet gauge. Keep the area clean. Use teething rings as they are very helpful. Chilled teethers are very helpful. Do not freeze the teether. Cold carrots are good teethers if the baby can chew on solid food. To prevent skin rash from excessive drooling use a cloth to dry baby’s chin. If baby is extremely uncomfortable, see a dentist. He/she may prescribe a medicine to ease the pain. Start cleaning your child’s teeth as soon as the teeth erupt. Use a wet gauge to clean them when they are partially erupted; once the front tooth erupts completely, use a soft tooth brush. Make sure you are cleaning the gums too. Use no fluoride training toothpaste, which is safe to swallow until your child learns to spit out the toothpaste. Brush two times a day and floss once. Stop the bottle after first birthday. Babies should not be fed in the middle of the night after they are 14-15 months old unless suggested by a doctor. Feed them a good dinner before you put them to bed. Avoid juice; water and fresh fruits are the best alternatives. Time does go by fast and one day your child will come and tell you that his or her tooth is loose. First baby tooth usually falls out at an age of six or seven, although some kids may start losing them a year early or later. Loose teeth can cause pain and kids sometimes will avoid brushing around loose teeth so it is important that parents help them keep those areas clean. Baby teeth usually fall out on their own, however, in some kids they can be stubborn and may stick around even after permanent teeth have erupted. In that case they may need to be taken out by a dentist. Other important thing to watch out for is the first permanent molar also called six year molar. This is a very important tooth and it erupts behind baby teeth; kids are not used to having a tooth so far back and can easily skip brushing them. Also it is a big tooth and can cause considerable amount of pain and sometimes infection too due to food collecting around it. Salt water gargle, brushing and massaging that area will help ease the pain. As soon as the molar erupts it needs to be sealed. Sealant is like a nail polish coat that goes on top surface of the molar. It prevents food from collecting in groves and helps reduce the incidence of cavities. Keeping all these things in mind will help your children develop healthy teeth and a beautiful smile. Books to educate children and get them to maintain a good oral hygiene. They are free and can be downloaded on Android and Apple phones and tablets. Parents with Android phones and tablets. “Sam and the Sugar Bug,” will teach them the importance of good oral hygiene. Leila and the Tooth Fairy,” will help them make healthy choices. “Leila’s first visit to the Dentist,” will make their visit to Dentist easy. I am a dentist by profession and I live in California. I am the author of the book, Sam and the Sugar Bug, Leila's First Visit to the Dentist, Leila and the Tooth Fairy, Funny Teeth and Bunny Ears and Boogers, Boogers.